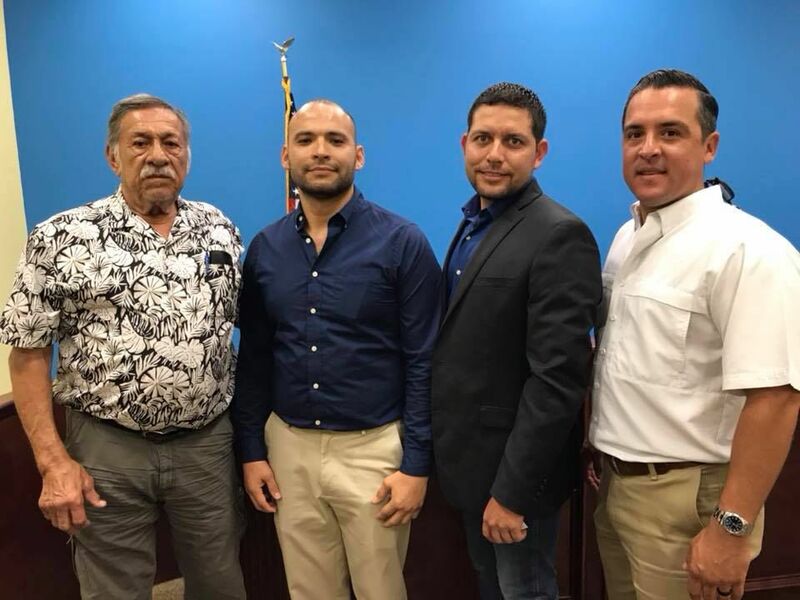 PALMVIEW — A candidate vying for the Agua Special Utility District board of directors is facing questions regarding his eligibility. Julian Peña, who is running for the Sullivan City seat on the Agua SUD board, is being scrutinized over his occupation after his opponent and current board director for Sullivan City, Ivan Sandoval, filed a complaint alleging Peña is ineligible to serve on the board. Peña lists construction as his occupation in his candidate application; however, he also described himself on his personal Facebook profile as a “developer” as well as the owner of JP Developers LLC, which would disqualify him from serving under state law. The information has since been removed from his social media page. Peña said JP Developers was never a registered company and that it doesn’t exist. His reasons for listing it on Facebook, Peña said, were personal and had to do with a prior relationship. Sandoval would not comment on the complaint. During an Agua SUD meeting last Tuesday, the utility district’s attorney, Frank Garza, told the board he would be forwarding the complaint to the elections division of the Texas Secretary of State’s office. “He is ineligible if indeed it is proven that he is a general contractor, a developer,” Garza told the board, citing Section 49.052 of the Texas Water Code, which states that a developer of property within the district is disqualified from serving on the board of directors. It also disqualifies anyone who is related, within the third degree of affinity or consanguinity, to a developer in the area. One board director, Homer Tijerina, who has endorsed Peña, dismissed the complaint as a political move and said Peña works in construction but is not a developer. Tijerina said he met Peña roughly a year-and-a-half ago and said he supported him because he believed him to be the better candidate. “He wants to do what is right; plus the main thing is that he doesn’t work for the school district,” Tijerina said, adding that he’s received calls from constituents concerned over employees of the La Joya school district serving on the Agua board. The perception of political pressure from the La Joya school district led state Sen. Juan “Chuy” Hinojosa to take legislative action in the form of Senate Bill 814. The bill, which went into effect September 2017, prohibited the Agua board of directors from employing La Joya school district board trustees. Wanting to maintain a watchful eye on the elections, Hinojosa has again taken action by requesting that a state inspector from the Secretary of State’s elections division to be present at the polling places. “Having an elections inspector will allow for greater voter confidence by increasing the accountability of the process and provide protections to our voters from any inappropriate or unlawful activities,” Hinojosa wrote. The elections division confirmed they would have an inspector in place during the election. Early voting began Monday and will run through May 1. Election Day is Saturday, May 5.